To lead off the game for the Jets, Zach Arambula hit a grounder down the third base line. Bryan Grillo groaned out the call giving Joe Yee a hint the ball was down the line. Yee laid out too soon and did not track the ball well. San Antonio was on the board and Boston was off to a tough start. Axel Cox brought his rings from Austin to the plate and whiffed for the first out. David Crystal Smith worked the count to three strikes and then lofted a high fly ball which bounced of Shawn Devenish’s chest in left field. Devenish could not corral it and San Antonio led 2-0. Aaron Almanza then lofted a high fly ball down the third base line bouncing right near Joe Yee, but Yee hit the ground to early and the ball got away from him for a run. The Almanza connection brought Rene to the plate and he lofted a deep fly into left field where Shawn Devenish made a nice play for the second out. A great play for Shawn who had worked so hard on his defense since his rookie campaign in 2016. Ricky Ruzika then hit a line drive to the right side off the chest of Rob Dias who was playing on the Right Shorty position, Dias kept cool and picked up the ball in plenty of time for the out. A rocky start to the inning ended with two great plays. The Jets led 3-0. For Boston, Christian Thaxton led off the inning with a hard ground ball bouncing of the left front man, Isaiah Wilcox. As Thaxton raced toward first, Zach Arambula crept up from his left center position to pick up the ball in time for a big Jets out. Rob Dias then lined the 2nd pitch he saw to the right side and raced toward first base. Axel Cox ranged to his right but Dias was too quick and put the Gades on the board. Looking to the tie the game, McCormick laced the second pitch he saw into left center. Zach Arambula ranged over and made a great play to nail Joe for a big out. Joe Yee would then strike out to end the Renegade’s inning. The defense of Arambula and Joe Yee would be a difference in this first inning. The Jets led 3-1 after a full frame. In the second inning, the Jets would be back at the top of the order. Zach Arambula could not get going here and led off with a rare strike out, a gift for the Renegades. Number two hitter, Axel Cox hit a hard grounder up the left side that eluded Justen Proctor and rolled out to the rover spot where Shawn Devenish laid out for his 2nd stop of the game. Boston had a chance to get out of the inning unscathed. Smith came up and hit another deep ball to left field right at Devenish. Shawn had it lined up but when he hit the ground, his arms got pinned under his body like T-Rex, and these little arms could not grab the ball in time. He made a great play to line it up, but he used poor mechanics and that would hurt. The pain continued. On a fly ball down the third baseline off the bat of Aaron Almanza, Joe Yee hit the ground too early and could not pick the ball cleanly. Rene Almanza would hit another line drive that would bounce of Rob dias’ hulking chest. That “chest” made the stop. The Jets were now up 5-1. Boston had lined up 4 of the 5 plays but was playing too tight on defense. Shawn Devenish led of the 2nd inning and with two strikes hit a weak grounder to Ricky Ruzika at the right shorty spot for a room service out. Larry Haile came off the bench to pinch hit for Joe Buizon and hit the first pitch he saw down the third base line. Haile raced down the third base line as Wilcox raced back to the line Wilcox gave way to Almanza and that hesitation would be enough for this perfectly placed tweener to plate a Renegade run. Back to the top of the order and Christian Thaxton dug in at the plate. Down to his last strike, Thaxton laced a bomb into left to bring the Renegades back to a 2 run deficit. Next, Rob Dias smoked a line drive up the middle, but Zach Arambula was in the right place at the right time and the ball kicked off his shin. He was able to recover and put Rob out for the second out of the inning. Isiah Wilcox would end the inning by making a nice play on a weak pop up to the left side off the bat of Joe McCormick. The Jet’s defense was making more plays than the Renegades. Leading of the third inning would be the six-hole hitter, Ricky Ruzika. Ruzika who blasted on to the beepball scene in 2016 had not been practicing as often in 2018 and was not hitting during the series. He led off the inning with a strike out. Zach Arambula then hit a worm bunrer down the third base line. Justen Proctor made a great play running back toward the line and gobbled it up for his first stop of the game. Again, the Renegades had a chance for a 1-2-3 inning. Axel Cox stood in the way of this goal. With two strikes he hit a 40 foot dribbler to the 40 foot arc. Justen Proctor raced in to the line and could not hear it. Cox plated a gifted run. On the very next pitch, Bryan Grillo called a short ball and Proctor raced in as the ball rolled past him. He had to put on the brakes and run backwards. The bad call cost the team a run and Smith had his 3rd run of the game. Aaron Alamanza decided to pick on Justen Proctor again and hit a weak grounder to him. The ball kicked off Proctor’s body. He made a nice play to get to his feet and chase it down, but he could not hear it in the grass and the Jets had 3 straight runs off one of the best defenders in the game. For the 3rd straight inning, Rob Dias would stop the bleeding and make a nice stop on a fly ball to the right side. The Jets were up 8-3 against a shaky Renegade effort. The bottom of the third inning would start with Joe Yee. In a comic moment, Yee fouled the ball to the Renegade bench and coach, Jason Lenicheck caught it on the fly. He then fired it over the head of Ron Cochran into the San Antonio bench, much like he did as a third baseman for Acton Boxboro High School. Joe Yee then grounded a ball up the middle where Zach Arambula stopped him for the first out. Shawn Devenish had no answer as he struck out. Weissman gambled next. Joe Buizon had hurt his hamstring against the Blind Jays on day one of the Series after scoring three times. Buizon had told him he was ready to go and Weissman rolled the dice looking to get something going down by 5 runs. That gamble failed. Buizon went down on 4 straight pitches. Boston had a donut for the inning. The Jets had a chance to put some distance between them and Boston and extend their five run lead. They would start the inning by pinch-hitting for struggling Ricky Ruzika. Will Lopez would get his first at-bat against the Renegades in his career. Lopez, a rookie in 2017 was hurt much of that campaign. He wasted little time and on the second pitch hit a weak ball up the middle of the field. Proctor ranged to his left and stopped it but could not pick it up. A disturbing trend. Zach Arambula delivered on the first pitch he saw. Cox then hit a grounder up the left side that alluded both Proctor and Devenish. At the start of the inning, Weissman had moved Joe McCormick over to third base. David Smith hit a grounder past Proctor’s left. McCormick ranged way to his left and made a big stop for the Renegades to pick up Justen. Aaron Almanza then hit the first pitch he saw down the third base line. Proctor raced to the line and as he went to the ground, the ball got tangled up in his legs and he pinned it and made the play. Proctor was all smiles and never lost his cool. Rene Alamnza then lofted the first pitch he saw to the right side. Rob Dias tried to line it up and as he was making the play, Almanza missed first base. Dias had the last out of the inning for the 4th inning in a row. Weissman asked the team if they were done. Haile led the team in a big cheer and Thaxton stepped to the plate. On the third pitch, Thaxton hit a grounder down the third base line and scored for the second time. The ball hugged the baseline and the defense could not pick the ball cleanly. Rob Dias hit a shot into left center. Zach Arambula was there again for a big stop taking the ball away from the Renegades. Joe McCormick laced a weak line drive off the back of Ron Cochran on the first pitch that was headed to Arambula. On the next pitch, he hit a weak grounder up the middle of the field and Wilcox made the play easily. Larry Haile was looking to extend the inning as he was entering the game as a pinch hitter for Joe Yee. Haile hit a line drive to the right side and on a bang-bang play, the umpire ruled in favor of Rene Almanza who ranged to make this play near the line. Boston hit the ball well, but had just one run to show for it. After four innings, the Jets held a commanding 11-4 lead. In the 5th inning, The Jet’s brought back Ricky Ruzika who had been pinch hit for. He would lead off the inning with a strike out. That trend followed when Zach Arambula also struck out. For the first time all game, Boston would get a 1-2-3 inning when Shawn Devenish made a nice play deep in the defense off the bat of Axel Cox. For the first time, Boston had some momentum. As things sometimes work in baseball, if you make a nice play on defense, you lead off the inning. Lead off the inning is exactly what Shawn Devenish did. The Renegades were down to their final 6 outs and down 7 runs. That is scary math for sure. Devenish would work the count deep as he would miss the first two pitches and then foul off three straight before lofting a pop fly about 60 feet to the left side. His new-found speed beat out the play. This brought the experiment, Joe Buizon back to the plate. Could he run was the question. On the 2nd pitch, he hit a pop fly that traveled about 42 feet with back spin. Ruzika raced in and struggled to find it. Buizon was not running well and then resorted to poor base running technique when he flopped before the base. Weissman was regretting letting him hit as he had not seen him run before the game. Buizon was gutting it out, but his leg was just to injured. He was playing with all heart at this time. Thaxton then rolled his wrists over and hit a grounder to the left side and beat it out for his third run of the contest. It was just the 2nd time in the game they had put up a crooked number in an inning. Rob Dias was on fire. He had three at bats leading up to this one and had seen just 4 pitches that resulted in three quality hits. He stayed hot and hit a bouncer to the left side. It got by Wilcox in the front but Arambula dove in head first on this ball and stopped Dias. The Jets ran off the field..but there were only two outs. The Jets influenced the Renegade battery and Weissman and Cochran limped to the bench. When the confusion resolved, McCormick crushed the ball by the entire defense in right center. Haile would get close as he crushed a ball down the third base line which would have been a run but it rolled foul by just a few inches. He then struck out to end the inning. Boston had pulled the game to a 4 run deficit and trailed 11-7. They really needed a solid 6th inning of defense. 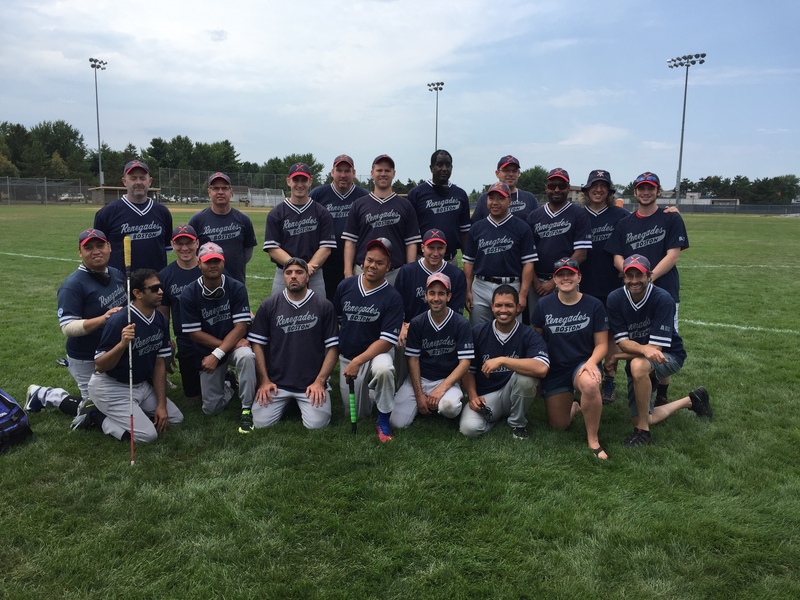 The Renegades were playing looser and more confident. David Smith would leadoff the inning with three runs on the game. Smith and Aron Almanza would represent 6 of the 11 Jet runs, Smith hit the first pitch up the gut of the defense. This time Joe Buizon (who re-entered for defense in this inning) made a tremendous stop on a bouncer for a big out. Aaron Almanza and Rene Almanza would strike out giving Kevin Sibson seven strike outs in the game as the Jets went down on their second donut inning of the game. They left the door open for the Renegades to come back. The winner of this game would advance to the next round. The loser would be eliminated. Boston would have their 5-6-1 spots in the line up to start the inning and would need 4 runs to tie. It was do-able for sure. Boston had been hitting the ball better than the Jets. The key difference in this game was the play of Zach Arambula on defense who had six stops on defense in left center at this point of the game. On Boston’s side, Justen Proctor was just 2-10 while playing defense at Left Shorty. It would be an uphill battle for sure. The 5/6 spots in the order were just 2-6 on the day. Could Devenish light a fire for the Renegade offense as he did on defense all day? He hit a hard bouncer up the left side that bounced over Wilcox. Zach Arambula stole the show in this game with his defensive play. Arambula who had his best game of the tourney in this match ranged way to his right to make a nice stop. Joe Yee re-entered the game for the hobbled Buizon and hit a dribbler to Wilcox. Isiah misplayed it as it slowly rolled away from him as he was on the ground. Yee took a perfect line down the third baseline and scored. Christian Thaxton was next up and gave the Renegade bench a ton of hope. On the first pitch, he hit a grounder right to Wilconx. Isiah made the play like a hockey goalie on his knees. A dangerous attempt for sure, but the out as made. It was a huge out for the Jets. Rob Dias was on fire and was next up. He stayed hot and fouled off the first pitch he saw. That was 6 pitches from Cochran in his 5 trips to the plate. He made contact on every one of them. Something happened, Maybe San Antonio Voodoo? Cochran and Dias would suddenly lose it. Three straight pitches and no contact. A strike out, the game was over. Boston was eliminated. It was not a good defensive effort for the Renegades. Boston actually may have hit better than the Jets, but the Jets defense was much improved, especially in left center. The Jets would go on to play the Indy Edge next, and beat them. They would eventually lose to the Bayou City Heat and finish 3rd in the World Series. Boston would walk across the field to play the Austin Blackhawks. An Austin team with many ties to the Jets as pitcher Kevin Sibson’s brother, Wayne was still playing with Austin. Austin has more rings than any team in league history. Boston is the only team that has ever risen from the doormat of the league to the top by using only players from their region. Ron Cochran expressed his distaste for consolation games, which in some way, this game represented. Joe Quintanilla was quick to state, the season is so short, every game counts. Tornado sirens tore through the complex just before the Renegades found the field. When the hour delay was over without damage, both teams would trot out their starting line ups and the battle was on. Austin won the coin toss and chose home team. Before the game, Christian Thaxton and Weissman decided to have Thaxton switch back to a metal bat. Combine that with the fact, he felt the best had felt since his concussion 2 weeks prior and you could see Christian was almost back to himself. On the second pitch of the game, Thaxton hit a bomb into left and scored. Time was called. The ball was dead and Thaxton had to return to the plate. It was the first dead ball the Renegades hit all week. On the very next pitch, Thaxton hit a rainbow into deep left for a score. After a Dias strike out and a McCormick dribbler to the Austin left shorty, Darius Sterling, Larry Haile came to the plate. He hit a line drive into left that looked like a run, but deep man Brandon Chesser stopped him. This had a similar feeling to the previous game when Zach Arambula of the San Antonio Jets killed Boston making grabs in left center. In the Bottom of the first, Boston would catch a break as the Blackhawks lead off hitter struck out to start the game. Boston was loose and that may have contributed to some of their best defense of the week, a sweet feeling after the stinker they played just an hour earlier. Austin pitcher, Tim Hibner tried to test the right side of the defense in this inning and came up empty as Rob Dias stopped Steve Puryear at the right shorty spot. Mike Finn then went to the right side and was stopped by first basemen, Joe McCormick. boston led 1-0 and won the first inning. Austin had their 4-5-6 hitters up. Justen Proctor stopped Greg Roberts. Next, Joe Yee, playing third base, made a nice grab to stop Mariano Reynoso. Darius Sterling struck out. Boston had the momentum for sure! The third inning would be a statement inning for Boston. Larry Haile re-entered the game as Weissman was looking for some offense, and on 6 pitches, he struck out. Back to the top as Thaxton was feeling hot. He hit a bomb into left field which Chesser could not coral in time. Rob Dias then scored on a grounder up the middle after hitting Cochran on the first pitch. Joe McCormick lofted a fly ball to the right side for his first run and the top of the order went 1-2-3 with runs, something these guys pay attention to and celebrate. Joe Quintanilla was brought off the bench on a hunch by Weissman to attack the right side. Attack it he did, but the wheels fell off when he was running and he was stopped by Jamie Sibson on a play he would have scored on in previous years when he was younger and quicker and lighter. 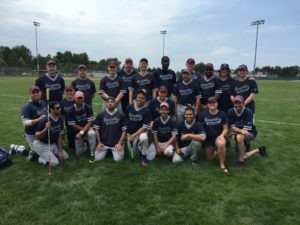 Shawn Devenish joined the fun with a line drive into right, by everyone for the 4th run of the inning to bring the score to 9-1 as Boston was on the brink of something special. Larry Haile then hit his second pitch into right field on a line and a 12 run game was in sight. Thaxton, Dias and McCormick got the ball in the air for their second 1-2-3 run scoring trip through the same inning. Boston led 13-0 and if they could hold Austin would put the game into a 12 run mercy rule. Brandon Chesser started off the inning with a ball that got by Joe McCormick and Shawn Devenish on the right side. If Austin could score one more run, the mercy rule would be avoided. Justen Proctor had something to say about that as he stopped Puryear and Finn. Ed Manning struck out in a pinch hit appearance for Greg Roberts. Boston had 12-runned Austin for the first time ever in just three innings. Now Boston had to play defense as Austin had 9 outs to work with. Austin was capable of coming back and Weissman knew it. They are a team that knows how to put the ball into play. The Renegades would need to “flash the leather”! In the 4th, Proctor would stop Reynoso. Dias would stop the speedy Sterling and Dias would also get Brandon Chesser, their best hitter. Tim Hibner kept aiming for the Renegade right side. He would come up empty. Dias did the damage in the 4th. In the 5th, Hibner got it by Dias, but McCormick was the hero. Joe Mac ate up Puryear and Finn before Proctor stopped Manning. Now the attention turned to getting players playing time as both teams had huge rosters. Soto went on to the field to play defense for Devenish. Austin would go to the bench for the next three hitters. Justen would make two stops in this frame and ball game! Boston would get its 4th straight (and only four) top 5 finishes. This game marked the 4th win by the Renegades by the 12-run rule in 2018. The Blackhawk coaches stood in shock and amazement at how well the Renegades hit. Mike Maguire of Austin said the team had not hit like that since 2016 and wondered out loud why they were taking it out on Austin. He may have been close in that statement. The exact same thing could be said of the Boston coaches, only their surprise was that it took this long to show it. For the game, Boston hit .591. The Renegades have only hit .571 or higher 16 times ever in a game, but it was the 5th time in 2018. On defense, it marked the 2nd time in the week Boston made 14 stops as the opponent only struck out 4 times. Boston has only accomplished this feat 18 times in a 6 inning game ever! In addition to this, Boston stopped 93.3% of the balls hit into play (14/15), which statistically is only the 9th best percentage. However, it’s the highest percentage with so many balls in play. The week’s defensive effort would rank the Renegades 2nd in the league in defense for the World Series behind only the Indy Thunder. If that defense had played an average game vs San Antonio, the team could have had a top three finish. The Renegades are an elite team in the NBBA. After the game, the team had a long talk. All the players could taste what had happened. They knew they did not play well vs San Antonio. They know they could have done better. The talk turned to 2019 and the players seemed unified at working harder and getting faster. Time will tell, but this team is a special team for sure. Three major injuries kept one of their best defenders (Thaxton) off the field. These injuries also kept Thaxton’s bat quiet early in the week and ended the season offensively for Sanchez and Buizon. For a Renegade team to overcome this shows heart, grit and determination. Only one team in this league other than Boston could overcome that, the World Champion Indy Thunder. 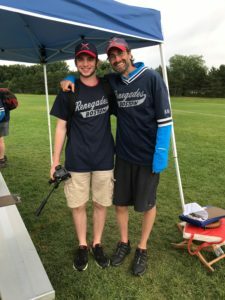 Be proud of your 2018 Boston Renegades!